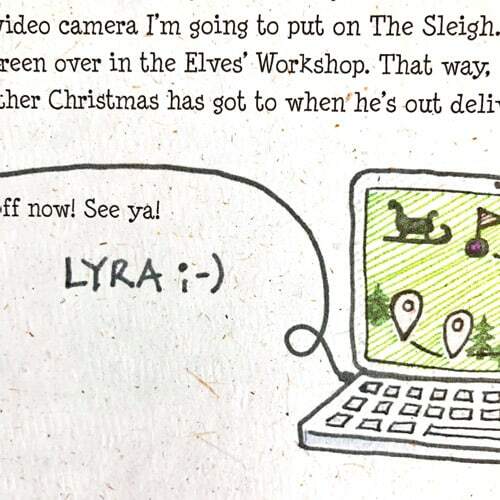 Our Elves fill their letters with secrets and snippets direct from their Workshop in the North Pole! As the Christmas season arrives, the excitement gets the better of the Elves. They’re easily distracted, rather clumsy, and make huge amounts of mess! They simply can't wait to tell your children all their North Pole News! Imagination is a wonderful thing, and as these Elves have such strong and distinct characters, your children will decide exactly what each of them looks like! 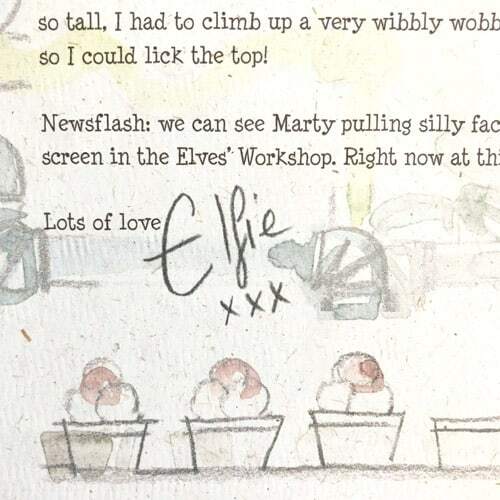 Elfie’s a sweet loveable letter writing and amateur painting Elf, who’s extremely chatty and loves writing to children! Fairly young in Elf years, Elfie gets totally overexcited by every little thing and is often at the brunt of Marty’s tricks and inventions. Some children swear Elfie's a girl. Others are adamant Elfie's a boy. Will we never know for sure? 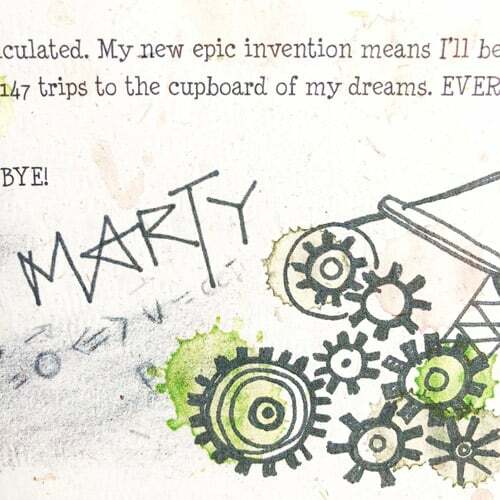 Marty loves pranks, inventions, experiments and sweets, and is always up to something. And this year is no exception! He’ll do anything to avoid hard work, or any work. The question is … has his new Magic Potion turned out as he’d hoped? He didn’t like how it tasted first of all, so he added a couple of things to sweeten it up. But … was this a big mistake? And will his new Automatic Dressing Machine ever work properly?? Being the most organised Elf, Lily’s started one of her infamous “Important Lists”. 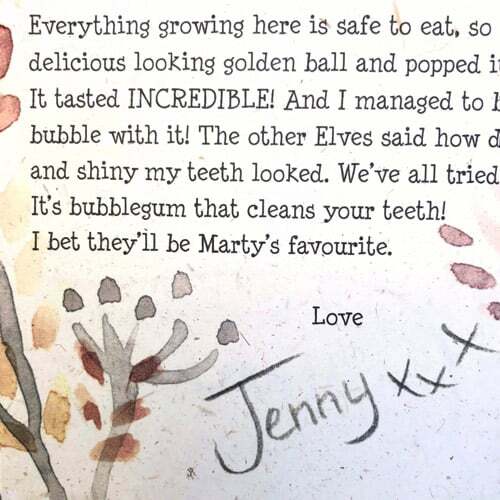 The Elves have been invited to a Disco Sleepover in the new Magical Ice tree on Christmas Eve! 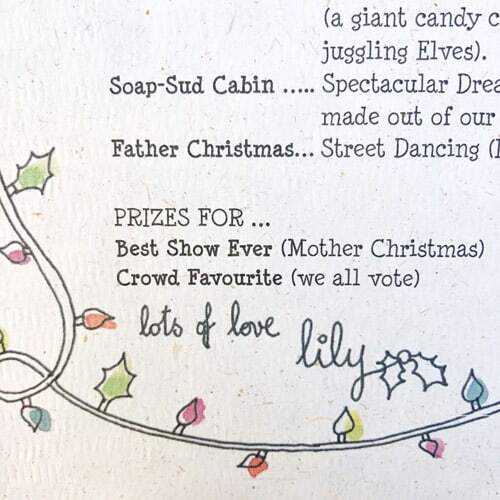 Among the prizes Lily has planned, are Magic Sprinkles (which change your hair colour as many times as you like, for one week), and a voucher to miss ONE weekly bath. Lily thinks Marty’s highly unlikely to win the “Best Behaviour After Festive Midnight Feast” prize! Lily's favourite way to relax is by knitting long stripy socks for the Elves. Dani's never happier than when he has a project: whether it's carving an emergency replacement antler for Rudolph, fixing the In-Flight Compass so The Sleigh can stay on course, or unblocking one of the pipes in the Magical Wind Machine. His list of things to sort out, seems to be growing! The big Clock in the Elves’ Workshop, which usually sings “We Wish You A Merry Christmas” to whoever arrives at the door, has been playing ‘There’s A Worm at the Bottom of My Garden” instead. Which is totally UN-Christmassy and not at all welcoming! But his most urgent job is to mend the Jingle Bells on The Sleigh. They’re all battered and bent, and sound terrible. 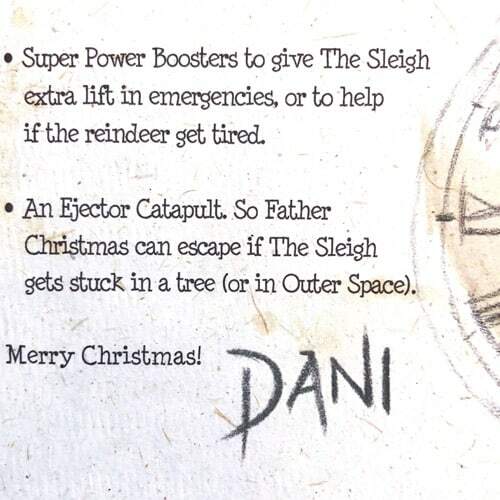 He’s also adding a few exciting ‘extras’ to The Sleigh this year … including an Ejector Catapult! 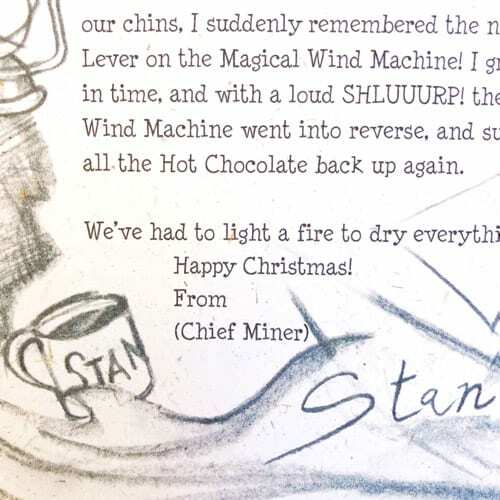 Stan’s the Chief Miner in the Cinnamon Mine. He has a permanent twinkle in his eye and is particularly good at drawing. He's one of the older Elves and knows more about the workings of the Cinnamon Mine than anyone, even Father Christmas! They were all woken up at precisely quarter past three in the early hours of the morning, by a loud GUSH. The Mine was flooding with Hot Chocolate! Despite drinking twelve mugfuls each, the Cinnamon Mine continued to flood! Will they manage to get out in time? 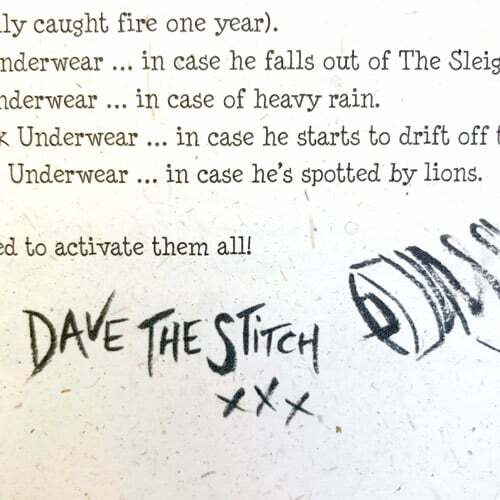 Dave The Stitch and the other Elves in Pine Needle Lodge, are working with a rather exciting selection of 40 different fabrics for Father Christmas’ special Christmas Eve Safety Underwear. They’re planning some very excellent safety features to cover all eventualities! The underwear controls will be linked up to Lyra’s new Computerised Route Planning System, to ensure the right feature is activated at the right time.